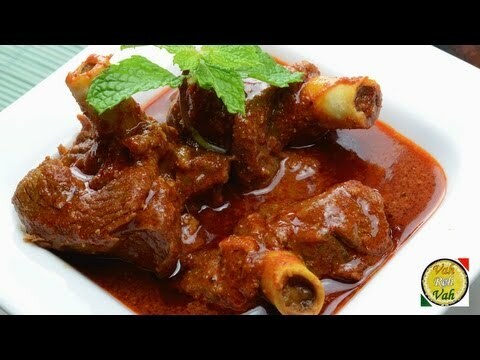 Mutton Rogan Josh is scrumptious delicacy from the Kashmiri cuisine distinguished by its thick, aromatic, flavorful red sauce and tender meat. Most people attribute this dish to the Kashmiri region but few say that it was actually introduced to the Kashmiri people by the Moghuls. This dish traditionally consists of lamb or goat meat which has been slow cooked in an amalgamation of yogurt and a mix of many flavorful spices. Due to the popularity of this dish and rarity of Kashmiri chilies, there are many versions where saffron, tomatoes and other types of chilies or paprika is used to achieve the Rogan Josh red color. In spite of including a lot of spices, the dish is not really hot compared to others. Mutton Rogan Josh is best paired with basmati rice or freshly baked naan. Rogan josh is creamy, rich, spicy, aromatic meat dish has its origin in Mughal cuisine, one of the largest Muslim influences on India. The authentic Kashmiri Rogan Josh curry is prepared with lamb or mutton shoulder, cooked to a tender, succulent texture in a gorgeously rich sauce packed with flavors. Traditionally the dish is prepared in ghee, with the spices fried in fat to stimulate flavors and infuse the fat with the essence before adding other ingredients. Yogurt, the base for the sauce, gives a lovely tang together with the tomato while almonds adds texture, flavor and also thickens the sauce. The mild heat from the chilies and pepper too compliments the dish. All in all, this dish has reminiscent flavors that we are to die for. For this glorious stupendous delicacy, guilty pleasure, serve Rogan josh with any flat Indian bread like chapatti, paratha, naan—the perfect choices for mopping up the rich gravy. Though there are innumerable variety of red chilies in the market, the Kashmiri red chilies is always the best which have bright red color with high retention. They are also less pungent in nature and having the ability to give a rich red color to flavor Shahi gravies and curries. Kashmiri red chilies are added to various marinades and preparation for making veg and chicken dishes. The roasted Kashmiri chilies have a unique and exotic aroma that spreads immediately when roasted on hot tawa or in oven. These chilies offer their best while making tomato sauces, soups, stews etc. Kashmiri red chilies contains good amount of vitamin C and vitamin which is necessary to boost the immune system of the body. It has vitamins B and E which are ultimate source of low fat and low cholesterol. Kashmiri cuisine History states that the modern Kashmiri cuisine were traced back to the 15th century invasion of India by Timur, and the migration of 1700 skilled woodcarvers, weavers, architects, calligraphers and cooks from Samarkand to the valley of Kashmir. The descendants of these cooks, the Wazas, are the master chefs of Kashmir. Wazwan is considered to be the ultimate formal banquet in Kashmiri comprising of a thirty-six course meal, out of which between fifteen to thirty are meat preparations cooked overnight by the master chefs and his assistance. Fennel seed powder 1/4 Tablespoons. Kashmir Red chili powder 1 1/2 Tablespoons. Cinnamon sticks (small) 4 Piece. Turmeric powder (optional) 1/4 Teaspoons. Take a bowl add Asafoetida, Kashmir chili powder, ginger powder, fennel seed powder, water, mix it well. Take blender in this add cinnamon sticks, green cardamom, mace, cumin seeds, make a coarse powder. Heat ghee in a pan add black cardamom, add meat pieces, cook it in a slow flame till meat is brown in colour and add mixture of Kashmir chilly, saffron, water, salt, mix this well, put the lid on let it cook for 45 minutes till the meat is tender. In this add made masala powder, mix it well and let it cook for 30 minutes. Serve this with naan, basmati rice.